Dog mansions are becoming quite popular around. Made specifically on order, they can be custom designed according to the client’s specifications. Paris Hilton for instance had a two storey mansion built for his dogs. The 300 square feet dog house cost a whooping USD 325,000. A typical mansion is fitted with an in-house water supply and lighting system and Paris Hilton’s which was by the way designed to look like her own estate, was fitted with a chandelier. These are also designed on order to custom specifications. They have their own water supply and lighting and according to the budget and customer requirements, they could be fitted with even better systems such as for instance, air conditioning systems. A typical hacienda goes for USD 30,000. 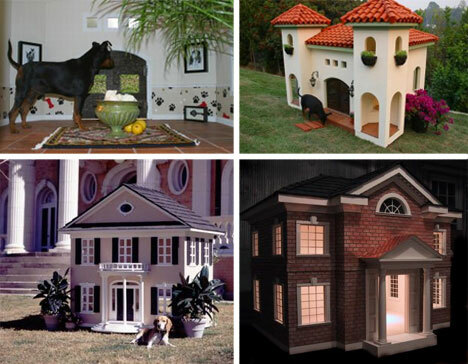 Designed by a certain company, the farmhouse is much like the human version, only smaller and designed for dogs. Of course, you would have to part with at least USD 2,200 but that is a small price to pay to buy your dog a great lifestyle. The farmhouse is fitted with shutter-proof glass to prevent accidents resulting in window breakage. These are again designed on order and can be custom fitted to specifications. If you have ever wanted for your dog to feel like royalty, there is no better way to show it. Designed with all the modern systems, the dog house is very well built for the high end client. For it you would have to part with no less than USD 3,400. The colonial costs at the very least USD 6,100 and it comes with all the modern systems including in-house water supply and lighting. It is also fitted with shutter-proof glass. Of course it can be modified to different sizes and with other custom requirements as per specifications. If you are looking to give your dog something expensive for his or her dog, you should really consider upgrading his or her living conditions to any of the above. I mean, why settle for a USD 20 house in which he or she can barely fit?